SAN DIEGO (KGTV) - Recent remedies aimed at reducing San Diego's homeless crisis have not been enough, according to a scientific 10News/San Diego Union-Tribune poll. 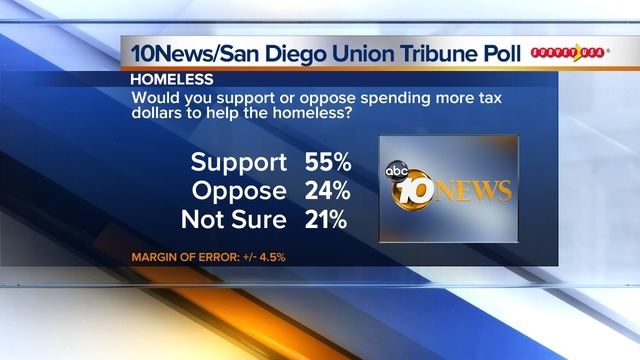 The poll of 800 San Diego adults showed sentiments about addressing homelessness are not positive. 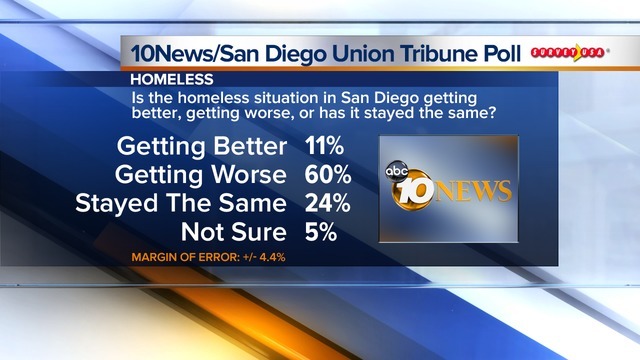 When asked if they believed if homelessness was getting better, worse, or staying the same in San Diego, only 11 percent said it was getting better. About 60 percent said it's getting worse. Many believe that blame lies at the top of local government. 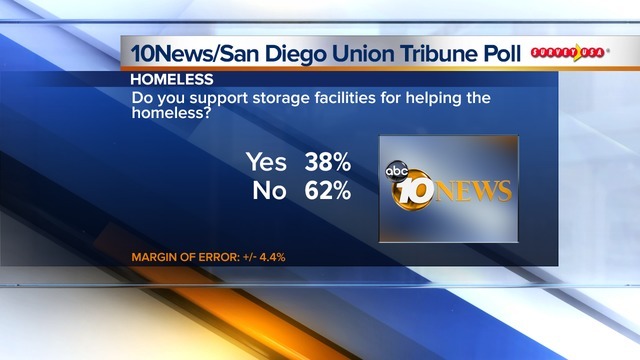 When asked who is most responsible for reducing homelessness, 53 percent said elected officials and 18 percent pointed to the homeless and their families. So what's led to San Diego's homelessness? Of those surveyed, 33 percent believe housing costs have contributed most to the homeless crisis, 22 percent said substance abuse, and 20 percent said mental health issues. Recently, San Diego officials opened three temporary tent shelters to try and transition some of the city's homeless population into housing. When asked if they thought the tents helped, 51 percent said yes, 20 percent said no, and 29 percent were not sure. A report by the San Diego Housing Commission shows from December 2017 to March 2018, 946 people have exited the three tents. Out of that, only 94 people have been placed into permanent housing.